Wed 19th July - Everyone seemed jovial and in high spirit at the breakfast tables of the little Hua Kee coffee shop in Kapit. We were probably their single largest paying customer in a long time as we gobbled up in true mountain bikers tradition, the noodles, hard boiled eggs and an assortment of beverages spiked with protein powder; and including the usual morning 'doping' rituals of vitamin supplements and iron capsules. I still needed my anti-histamines. As we boarded the express boat for Song under the bright early morning sun, I guessed all of us had this quite sense of relief that today's stage would be like our normal Sunday ride along the single tracks of Kuching; shaded, relatively technical and middle chain ring experience. It was Hollywood this time as 'Gladiators' kept some of us , especially Glenn, entertained during the one-hour journey to Song. "This is the fifth time I have seen this movie", he enthused. Perhaps he could relate to the gladiators. With folks of Rumah Rawing, the entry point to the 'Communist Trail'. In the background is the mighty Rajang River which is 350 miles long; what it lacks in length to the Amazon River, it makes up in the volume of water discharged into the South China Sea. After a quick check-in into the well-maintained Song Government Rest House, we were transferred to Rumah Rawing; about 25 speedboat minutes away. The place was bustling with expectations and excitement as we climbed up the long steps to be greeted by the headman and his entourage. Thankfully we were spared the traditional welcoming ceremony ( where a pig is speared before visitors enter the longhouse). Glenn would probably have been eager to do so after watching 'Gladiators'. (Sorry, Glenn, picking on you again.) Instead the entourage was given a traditionally tour of the longhouse (43-room long); from one end to the other accompanied by the sound of gongs and drums. Malcolm and I playfully broke into a nagjat (Iban form of dancing) every now and then to liven up the atmosphere. We, however, got the real thing when an elder (the guy with the jacket and tie in the photo) strut his stuff worthy of a ballerina. But, why is it called the 'Communist Trail'? Tuai Rumah (the headman) of Rumah Rawing had this to say, " During the communist insurgency, the locals needed a route to escape from the clutches of the enemies. And so this trail was cut deep into the jungle, carved over and round hills; and rugged terrain". There may be some truth in the story. As the longboat is the main mode of transport for the Ibans, it doesn't make much sense to cut a trail this long (15km) just to serve a longhouse (Rumah Sari) with no farming activities in between. Whatever it is, the trail provided the team a change of scenery from the previous day hot and dusty environment. The calm before the storm as the riders provided the folks some diversions from their normal rustic lifestyle. Eunice and Daron joined us as we cycled single file to the trail head, invoking ripples of greetings, laughters, giggles and curiousity from the locals in our wake. A few minutes into the trail, Daron remarked, "This is just like the the Singai trail back home in Kuching". The rest agreed in similar fashion as conversations flowed freely. Yes, a recovery ride it would be, with smiles all round. As the hot midday sun struggled to cast its heat through the leaves, you would have swore there were smirks on our face. The riders began to feel at home. 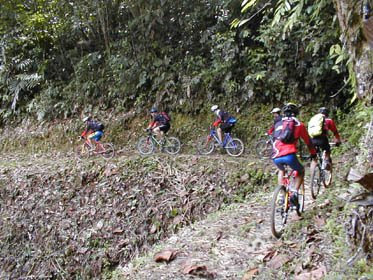 Roots, a mixture of short gentle and steep inclines with the occasional gullies and depressions, wooden bridges and tight single tracks were lapped up with glee. The two amazing guides assigned to us managed to keep up with us as a result of several stops for photo shoots. When you consider that it was a 3-hour walking journey to our destination, we were glad then to be on our saddle. That's right folks, the drop that you see in the picture on the right is a sheer one and this is reflective of the type of single track found most of the way to Rumah Sari. In some sections, one wrong move will send you clinging to branches for your dear life! 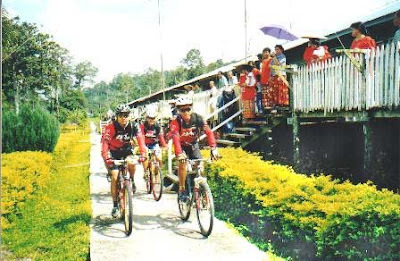 About 4 km into the ride, we came to the only longhouse between Rumah Sari and Rumah Rawing; Rumah Saing which was to prove its usefulness later in the day. We were still in the right frame of mind for a photo shoot as a stream crossing flow across our path. With the midday sun casting a beam of light through an opening of the canopy directly onto the stream, there had to be a Kodak moment as well as a time to enjoy the coolness of the water. As I surveyed the hike section on the opposite bank of the river, little did we know that we were soon to receive our baptism of fire. There was a sudden transformation of landscape as the trail became a footpath and the climbs became longer. Pushing and walking the bike was getting more regular. In some downhill sections, it was a stomach on the saddle experience and brake pads began to protest as they work overtime. "The terrain is so deceptive, the climb looks easy but the effort seemed herculean as the minutes ticked by" remarked Malcolm in disbelief as he checked his Polar HRM. Yes, the thick vegetation had camouflaged the severity of the elevation. The attrition rate began to take its toll. " I could hear my heart throbbing in my ears" said Daron in between mouthful of breaths. Liu found the going tough. Fatigue and lapses in concentration began to set in for the rest of the team. 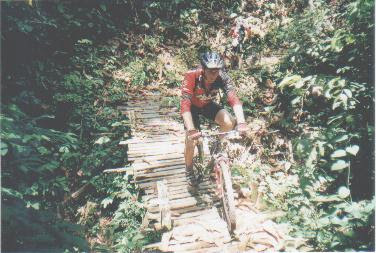 The single track took its literal meaning for a slight off-balance would send you down a 200-foot drop. I took a fall on the wrong side of the track and fortunately the trees and branches saved me from my momentary lapse of concentration. Wanting to make it back to Song in the early afternoon, we stepped up the pace a bit more and whatever recovery we were looking for vanished into the dense humid tropical rainforest. Soon the groups began to split up into three. Without the handicap of a pushing a bike the two guides caught up with the back marker. By then Eunice and Daron had decided that it was time to turn back. The two guides accompanied them. Fui waited for Liu while I went after Malcolm and Glenn. The remaining riders eventually regrouped at the foot of a hill. With no line of sight of our destination and carrying the flu, I decided to join Liu to retrace our way back to Rumah Rawing. Malcolm, Glenn and Fui soldiered on. And unbeknown to us, our destination was just over that hill! It's amazing how our mind functions isn't it? Had our guides been with us, Liu and I would have enjoyed the hospitality of the folks of Rumah Sari. "They have heard of our coming over the radio and they have been expecting us" reported Malcolm later. Another hazard, rickety old bridge. Rumah Saing, the longhouse I mentioned earlier was to be our transit point on the return journey. Eunice and Daron had earlier been feted with cordial drinks and biscuits. Liu and I happily rolled into the compound of the longhouse with little water to spare. We were spent! I could feel my body's temperature rising as the flu bug took advantage of the chaos in my internal organs. Eunice handed me an Advil tablet which helped me to drift off into a light sleep. It proved beneficial. I was awoken by the noise of Malcolm and Fui. But where was Glenn? "Oh, he is running with the bike", announced Malcolm. "A branch caught his rear derailleur and ripped it off its dropout and bending it in the process ", he added. Bad news! Hopefully we could find a saviour in Song. As our speedboat skimmed above the waters of the Rajang River back to Song, flashes of lightning streaked across the darkened sky. We knew that the ensuing rain would keep the dust away for the epic ride; Camp Iran to Camp Mapai. The only mechanic in town turned out to be Glenn's saviour as his hydraulic press flattened the dropout into place. A quick transplant job was done to solve Fui's Judy's hairline fracture problem. Eunice became Fui's damsel to the rescue when her Judy XL temporarily gave him a peace of mind for the much awaited highlight of the tour; 10 hours, 70-km of climbs and descends averaging between 1,500-2,200ft.